This is one of dishes I made with the vegetables I got at the weekend, Swiss chard and black olive quiche. It looks pretty good here as it had just come out of the oven, so its still glistening. Whereas here, it is cold and looking exactly like what is: a cold quiche. It was quite tasty though. When you bite into this pastry, the crust is quite delicate and crumbly. The Swiss chard being quite young and small, unlike those I am holding in my header picture (see above) tasted more like spinach. D said he liked the surprise hit of blue cheese. I didn't know quite what he meant then I remembered that I had just randomly dotted the cheese on the quiche as it was quite soft, so it had just melted where I had dropped it. 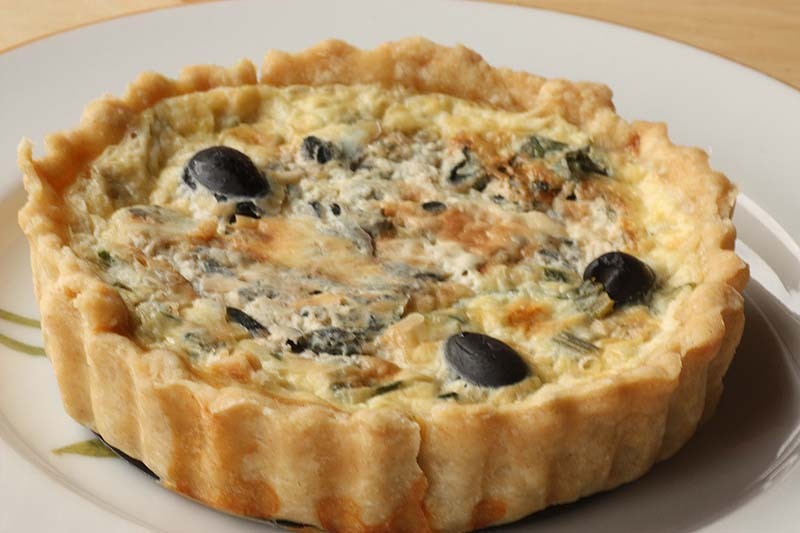 This certainly is a flavourful quiche. Sift the flour with the salt into a large bowl. Rub in the fat until the mixture resembles coarse breadcrumbs. Add a tablespoon water to the mixture. Mix to a firm dough. It may be necessary to add more water. Chill, wrapped for at least 30 minutes before using. Preheat oven to gas mark 6. Roll out the pastry and use to line a 7 inch dish. Chill for 45 minutes, then back blind. Lower the oven to gas mark 4. Melt the butter in pan, add the onion and fry over low heat until soft and golden. Add the garlic and fry for a couple of minutes, then stir in the chard, season with salt and pepper and fry briskly for a further five minutes. Spoon into the cooked pastry case. Dot the mixture evenly with the cheese. Whisk the egg and egg yolk together with the milk and cream. Pour into the pastry case. Scatter the olives on top and bake in oven for 25-30 minutes until the filling is just set and golden brown on top. Adapted from Leiths Vegetarian Bible. Great way to use chard! I just planted some in my garden, can't wait till it is up. I like my quiche cold, don't enjoy it at all while it is hot. 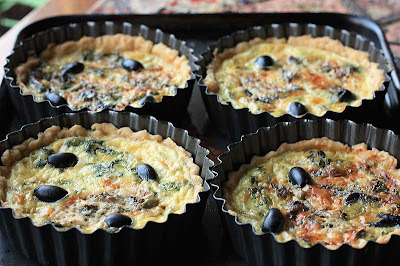 Dear Mangocheeks,Quiche with chard and olives looks very delicious. I would like to share some awards with you please accept them from my blog. sometimes these things come into their own after a day! I think the ingredients need a little time to be comfortable with each other! 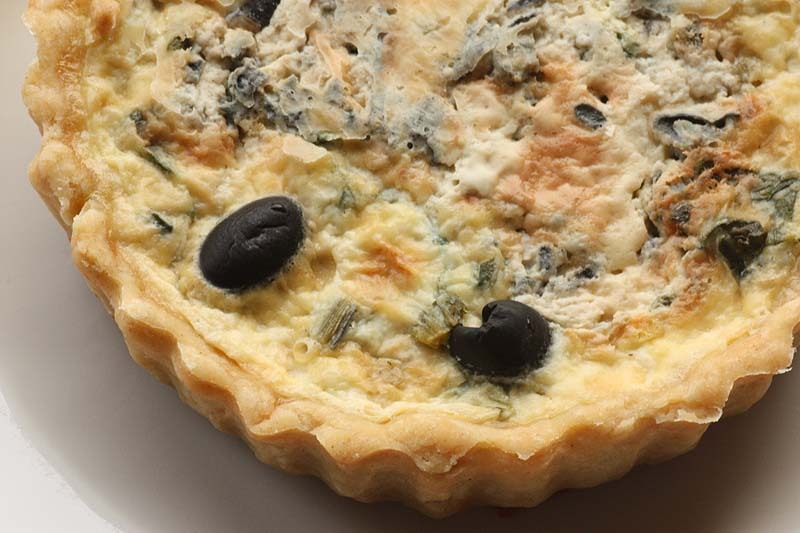 The combination of blue cheese and black olives sounds delicious and flavorful. I am going to reveal my lack of veg knowledge here (trying to learn!) but what is swiss chard? Is it leafy like lettuce or spinach, or more like an onion? Thanks for the tips. I love your recipes! 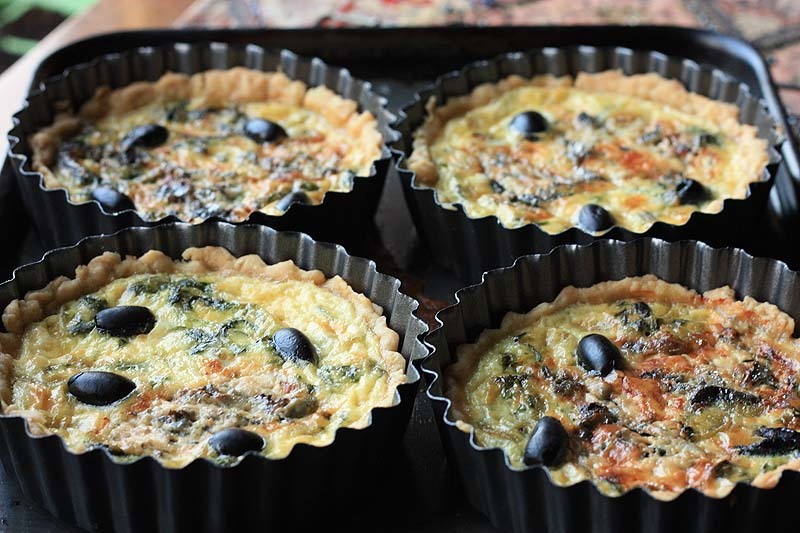 What georgous quiche tartlets! I so love swiss chard combined with black olives!! These tartlets rock!!! That looks wonderful. I'm a big fan of Swiss Chard and I always have too much. I might give that a go! The photo in the header is rally nice! I love colourful Swiss Chard, to grow and to eat. Funny enough my children prefer the taste of normal silver beet. I've always been a bit dubious about swiss chard...there must have been a nasty childhood experience with it. But this looks really lovely. Yum! That sounds delicious. I may give that a go depending on what we get in our veg box. Looks lovely, and this is something which can be eaten warm or cold, so good for picnics or work meals. I've never grown chard, but I'm giving it a go this year. Those look amazing and anything with blue cheese wins me over. The perfect thing to take on a picnic. Oooh, they look tasty. Love the blog! Oh dear, just checked back to see if you'd had time to answer my question, and realized everything I needed to know was in the original post. Sorry - let's just blame my lack of attention to detail on the fact that I was so caught up in your drool-inducing food photography, shall we? Gorgeous gorgeous post...as all of yours are! !Yum..Fabulous...lovely recipes!! Yay..inspiring! I must admit that does look very tasty but even when I was an egg eater I didn't care much for cold quiche, actually there are very few cold dishes I do like. Thank you so much Kiki. There are times when cold dishes work like salads of course, but I do know where your coming from as I don't think i'd like to eat something congealed - eek. Wow, your blog looks amazing, so inspiring. I'm getting hungry just looking at it! Thank you so much Controversial Veggie. So lovely to read your comment.